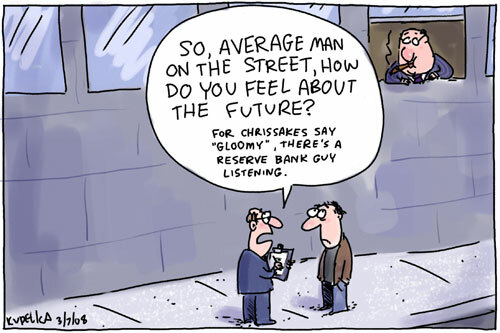 Luckily the mortgagees of Australia are currently miserable enough for the Reserve Bank to keep interest rates on hold for a little longer. First published in The Australian 3/7/08. I recently had the pleasure of speaking and giving a short exhibition of drawing at the opening of the Behind The Lines 2007 exhibition of political cartoons alongside Guy Hansen (curator of the exhibition) and David Bartlett (then Deputy Premier and now Premier of Tasmania – hey, a fortnight is a long time in politics). There was wine and cheese and everything. The exhibition’s on at the State Library in Hobart. There’s more info here. Go along and vote for me in the People’s Choice Award (cartoon pictured above) and then I will be an award-winning cartoonist and will finally have something to boast about. Another request – available as a print from “>redbubble.